As we approach flu season more and more parents will be confronted with a common question: Should I send my child to school? 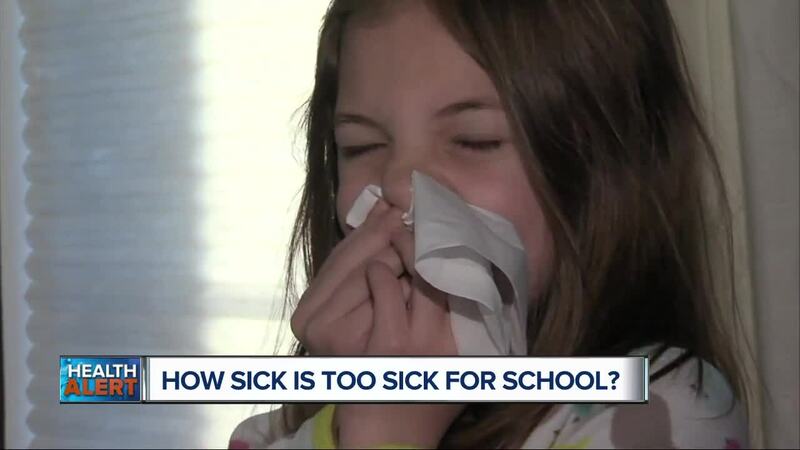 TROY, Mich. — As flu season approaches more and more parents will be confronted with a common question: Should I send my sick child to school? If you’re a parent, nothing causes more last-minute schedule changes than a sick kid. So when is it OK to send a child to school, and when should you keep them home? According to Kumar, you need to pay close attention to a child with cold symptoms. If there’s no fever, typically, they can attend school. However, she noted if the issue lingers beyond a few days it’s worth seeing a doctor. She noted that if you wait 24-48 hours a lot of simple infections will get better within that time frame. The key is whether they’re still active and eating OK.
Kumar said a fever means your child is fighting an infection, but children are at a higher risk of dehydration, meaning it’s a good idea to keep kids home if they’re becoming less active or battling a fever. Pink eye is another common kid illness. Surprisingly, a pink eye diagnosis doesn’t mean a long time off of school. “Once the pink eye is getting looked at by physicians and the child is on the appropriate antibiotics — whether it’s by mouth or by eye drop or eye ointment — after about 24 hours of having been on the antibiotic treatment, it’s safe to send them back,” Kumar said. Head lice has more to do with school policy in most cases than doctor’s orders. Plenty of health experts will say that if a child is being treated and has seen a physician they could be ready to head back to school. The same goes for ringworm. Once topical antibiotics are applied a child should be capable of returning to school, according to Kumar. However, she noted older kids are likely to be better about keeping the location covered. Either way, they still shouldn’t be sharing clothing, hats or accessories that could come in contact with the location of the rash associated with ringworm.